For Dr. Dennis Ayer and his team there is one main goal: helping you achieve your best oral health. Of course, we need a little bit of help from you in order to do that. 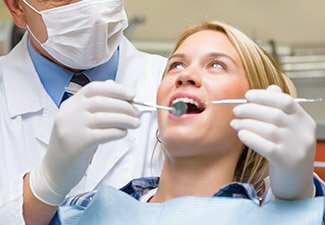 Scheduling regular dental cleanings and checkups every six months goes a long way toward having a smile that is healthy and attractive. Some of your family may even require more frequent appointments if they have a history of dental disease such as tooth decay or periodontal infection. Dr. Ayers will be able to advise you on how often you need to have checkups. Why Choose Dr. Ayer for Checkups & Cleanings? Many of our patients genuinely look forward to having their teeth cleaned. Our skilled dental hygienists use special cleaning instruments and fluoride toothpaste in the flavor of your choice to clean and polish all the surfaces of your teeth. We’ll also remove plaque and bits of tartar that can lead to periodontal disease. Dental cleaning in Leawood concludes with flossing between all of your teeth. Nothing can match the cleaning we provide in the office. During a dental checkup, both the hygienist and Dr. Ayer take the time to carefully assess the condition of your teeth and gums. Occasionally we spot problems before they are visible and before they start to exhibit symptoms. At the start, for example, gum disease may not be recognizable and you may not feel anything. However, there are steps we can take, such as measuring the depth of periodontal pockets around your teeth, which can indicate the initiation of gum disease. Then, we are able to treat sooner rather than later so you can avoid both the oral and general health consequences of this bacterial infection. At one dental exam each year, we’ll take digital x-rays that give us a clear view of your teeth, gum tissue and the supporting bone structure underneath. Digital x-rays offer several advantages over traditional film x-rays; they are viewed immediately on a chairside monitor and they expose patients to nearly 90 percent less radiation. Your exam will also include a screening for oral cancer. We’ll look at your lips and inside your mouth to find any suspicious looking tissue that may be cancerous or pre-cancerous. With early detection, oral cancer is treatable and often curable. Contact the dental practice of Dr. Dennis Ayer today if you have any questions about our dental checkups, or if you’re ready to schedule an appointment. We also welcome patients from the areas of Overland Park, Merriam, Prairie Village, Shawnee, Olathe, Leawood and beyond.